I will only share a small part of this recipe with you today. It's not that I don't want to share, I do, it's just that the recipe is long. Very very long. I like my fingers and I don't want them to fall off. Oh, and I'm too lazy to type it out. And besides, you should get the book, it's fantastic! The book in question is Death by Chocolate: The Last Word on a Consuming Passion . I've had this book for years, in fact it was one of the first in my collection and everything I've ever made from it has come out sublime. And the meringue recipe I'm including at the bottom is so multi-purpose that I'm sure you'll forgive me for not including the rest. The recipe I'm here to tell you about is the very last one in the book, the one that the whole book is named after, the one and only "Death By Chocolate" cake. It consists of a layer of a decadent brownie, a layer of rich ganache, a layer of cocoa meringue, a thick layer of chocolate coffee mousse, another layer of brownie, a thick coat of that rich ganache, and a thick piped topping of yummy chocolate mousse. Oh, and if that's not enough chocolate for you, it comes with a chocolate rum sauce on the side, you know, to really nail in that coffin. 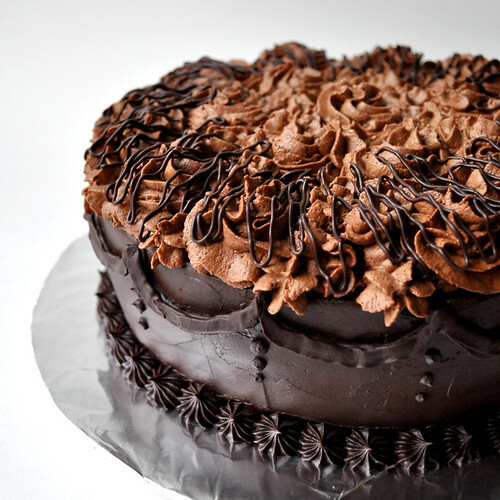 You can't eat this cake without going into a minor chocolate coma or without having bits of chocolate all over your face leaving you wondering how it got there. And with the extra meringue batter, extra mousse, and extra ganache you will inevitably end up with, you can make these yummy little sandwiches, that won't tip you over, but will make you swoon. - Preheat the oven to 225F. - If you want this to be a layer in a cake, using a 9 inch cake circle as a guide, trace a circle with a pencil on a sheet of parchment paper cut to fit a baking sheet. Turn the paper over and, with trace mark down, place on a baking sheet. Or you can just make freehand shapes to make sandwiches. - Place 4 egg whites, the cream of tartar, and salt in the bowl of an electric mixer fitted with a balloon whip and whisk on high until soft peaks form, about 45 to 50 seconds. - Gradually add 1 cup sugar while continuing to whisk on high and whisk until stiff, about 1 1/2 minutes. - Remove the bowl from the mixer and use a rubber spatula to fold in and thoroughly combine the remaining 1/4 cup sugar, 2 tablespoons cocoa and the cornstarch. 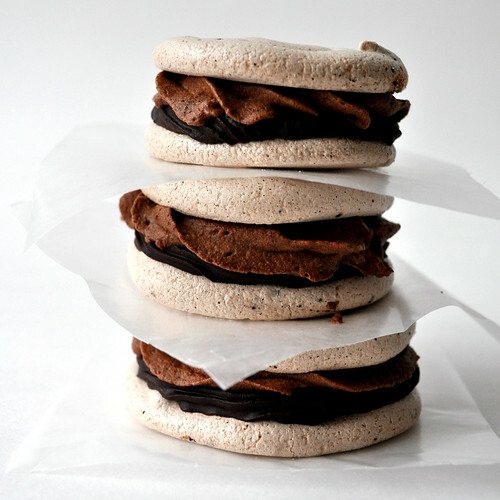 - Fill a pastry bag (fitted with a large round tip) with the cocoa meringue. Fill the traced parchment shapes with meringue: start in the center and pipe a 3/4-inch wide spiral towards the outside. - Place the meringue in the preheated oven and bake for 15 minutes. Lower the oven temperature to 200 degrees Fahrenheit and bake for 2 hours and 45 minutes. Remove from the oven and allow to cool for 45 minutes before handling. Don't skip this part, the meringues will crack if handled too soon. - Fill with ganache, chocolate mousse or whatever you like and enjoy! Man, could you send me some? I want chocolate. OMG - those meringue's look SO good!! Looks delicious, love that 2nd picture! Death by chocolate? Indeed! I think I just died and went to heaven! I know this is an old post, but I just wanted to let you know how fantastic your little cookies look! I recently made Death by chocolate. If only I’d seen this post before finishing, I would have made them for leftovers!